There is a lot of information about conservation on the internet, and some of it has helped my business. The client, who we will call Mr. B., brought this vellum document to me after he had read that to remove pressure sensitive tape you needed to purchase a heated spatula, crank up the heat, and when the adhesive became tacky peel the carrier off then scrape off the adhesive residue. He went to the local book conservation supply company, purchased a heated spatula, cranked up the heat, etc. What Mr. B. didn’t know, was that he was removing tape from vellum, not paper. And Mr. B. didn’t know was that vellum has a shrinkage temperature of between 55-64 degrees Celsius. I can only imagine the shock he felt when he looked down and saw this. And unfortunately it was over one of the most important areas of the document, where the signature was. Thomson notes that if a skin exceed the shrinkage temperature it is basically irreversible. After photographing the document, I lightly surface cleaned it with grated vinyl eraser and began a long process of slowly humidifying and trying to pull the vellum back into alignment. 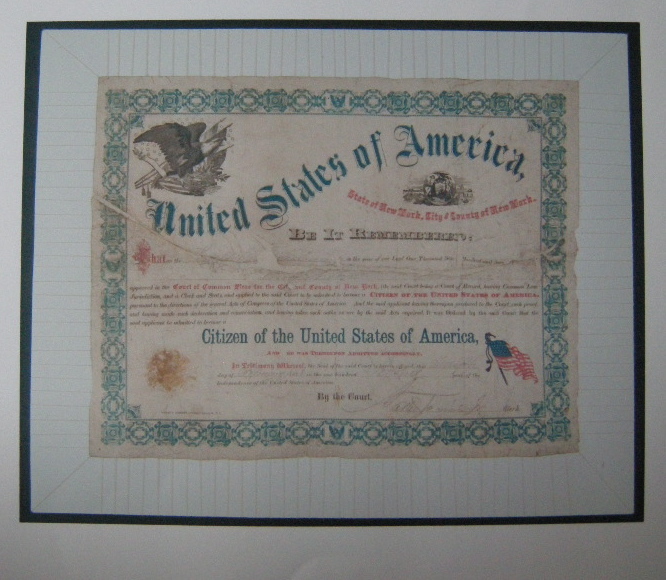 Originally, the gap in the middle of this document was almost 4cm. 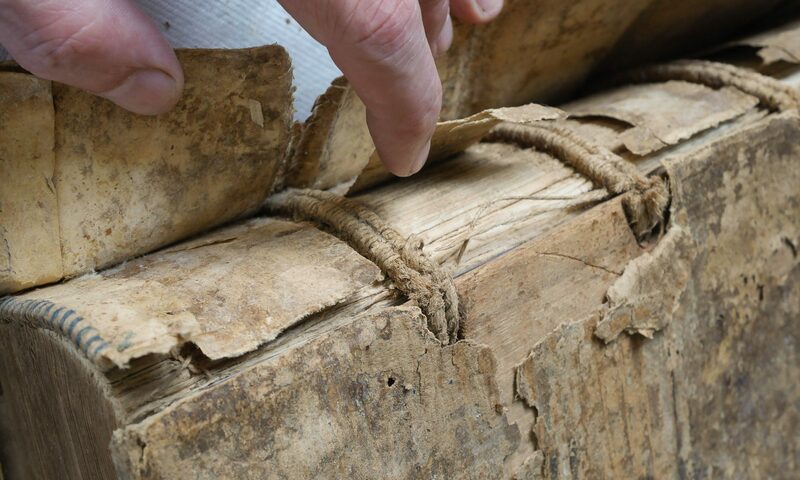 The treatment consisted of humidifying, pinning out, humidifying until I felt the vellum would not move any more. Perhaps some of the areas around the shrunken bits were close but not over the shrinkage temperature. Three times, the vellum was humidified, stretched, dried and pinned out. After repairing the losses with toned tissue, I constructed a thread mount. Mr. B. wanted to put this document on more of less permanent display, and given the large area of losses, I wanted a mounting system that would keep the two main halves as planar as possible. The beauty of a thread mount is that if the humidity increases, the vellum relaxes and the thread swells slightly, shortening in length and taking up the slack of the relaxed vellum. If the humidity is lowered, the vellum shrinks and the thread shrinks, causing the twist to loosen and lengthen. If the thread is properly chosen and prepared, this system of mounting can accommodate a range of changes in humidity. The next step was to mat the document, hiding the threads, then it was framed, care being taken to add spacers so the threads were allowed to move. The treatment ended up costing Mr. B. many times what it would have been if I had removed the the tape safely in the first place. Come to think of it, I haven’t seen Mr. B. in a while. 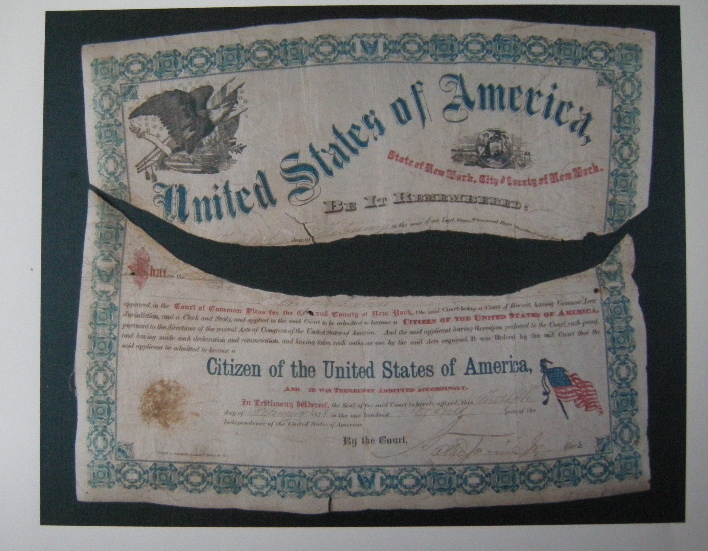 Very interesting project, a great repair to an almost lost document. I have mounted Vellum before but not like your method. Looking at your photo, I presume you have mounted the Vellum by threading round the edges of a Museum rag board with a continuous length of thread to maintain an even tension crossing on the back (or a short diagonal) to the next position? Or are they individual threads and tied? What type of thread did you use? Do you have a close up of your stitching method? I normally use a cotton thread weaker than that, which I am mounting. There may be workshops in England that cover this technique?